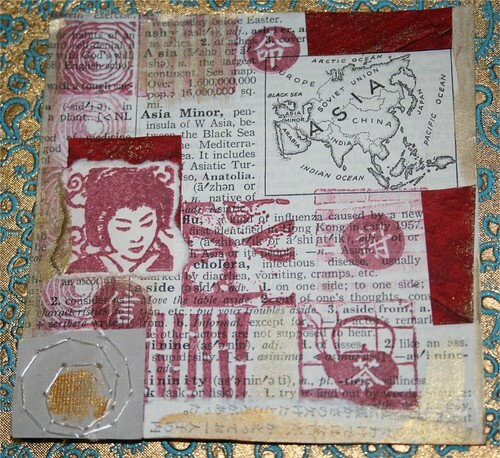 Asia Minor 4" x 4" Collage Card, originally uploaded by DianthusMoon. I’ve been tapping my creative juices thanks to the gnomes! I forgot how much I love painting and have done a few painted backgrounds for cards today. The one pictured has an old dictionary background and I was trying out some new Asian rubber stamps I bought at Big Lots the other day. I repotted a few things outside, but it’s just too muggy to do much more. The septic tank was cleaned out today (it holds like 1,000 gallons) using a new company. It needs to be done once a year to get the sludge out-ugh. Guess you didn’t need to read that. Very humid here as well today and it didn’t help having a thunderstorm earlier. Now it’s sunny and very muggy. I was just out there tying up some plants that the rain had flattened and it didn’t take long before I was all sweaty! Ick!! You pump out every year? That seems like a lot. Ours is the same size and we only do it about every three-four years. I don’t have a garbage disposal, though. If you do, that might add a lot “sludge”.